Artist Impression of Birkeland current filaments, A.K.A. "space tornadoes." The Mocoví, of the South American Gran Chaco, reported that the tree Nalliagdigua, which was “so tall that it reached from the earth to the sky”, was felled by “an old woman”. 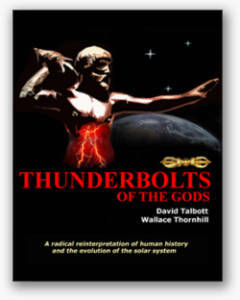 A pre-Buddhist tradition of Tibet related the downfall of dmu-thag, the “spirits rope” or “spirits ladder” joining the layered heavens, which the mythical kings used to traverse: “As a result the two worlds have remained for ever parted.” The motif of axial disruption received little attention from comparative mythologists in general, but it did inspire researchers exploring the role of plasma in mythology to conclude that our ancient forebears had witnessed a transient event whose magnitude has not been rivalled in the past 3,000 to 5,000 years. The model required a scientific mechanism to be plausible. Insofar as any energetic plasma activity in the upper part of the earth’s atmosphere is classified as ‘auroral’ by definition, an auroral storm of unprecedented intensity seemed to be at the root of the traditions. Too often, specialists in human traditions still conceive of the solar system as a sterile, Copernican region, in which planets, comets and asteroids are the only bits of matter traversing an otherwise absolute vacuum with clockwork precision. This view is long obsolete in science. It is now clear that the ‘solar wind’ conveys charged particles from the sun towards the earth, where the geomagnetic field deflects them to the night side of the planet. Occasional ‘leaking’ into the ionosphere through giant apertures then sparks bursts of auroral display. 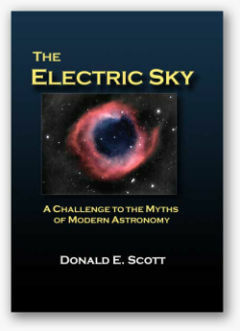 The solar system emerges as a finely structured framework of electromagnetic forces, currently quiescent except for the occasional coronal outburst of the sun. The exact mechanism of plasma transmission remains a vexing puzzle, however. Ever since solar weather was identified as the ultimate cause of geomagnetic fluctuations, scientists suspected that solar plasmas reach the ionosphere through ‘plasma cables’ known to plasma physicists as Birkeland currents – but the existence of these remained hypothetical. In a groundbreaking discovery, NASA’s five THEMIS aircraft, designed to measure the magnetic field of the earth, have now identified giant swirling space tornadoes, the size of the earth or larger in diameter, that channel electrically charged particles at speeds of more than a million miles per hour along twisted magnetic field lines into the ionosphere of the earth, where they power the auroras. Stretching thousands of miles into space and exceeding the earth in diameter, these whirling vortices are clearly the modern equivalent of the hypothetical Birkeland currents that spawned human stories about a past resplendent sky column. Structurally akin to the hypothesized axis mundi that dominates the world’s creation myths, these “space tornadoes” are highly dynamic, funnel-shaped and current-carrying structures governed by the same laws of plasma physics and prone to the same types of changes in morphology and behavior that account successfully for the mythical traditions. 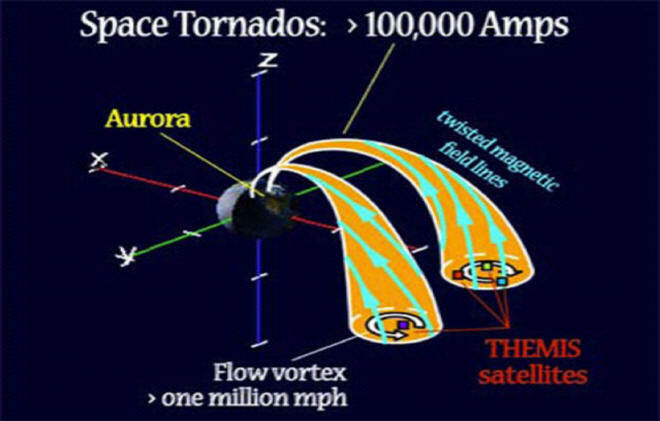 The difference between the mythical column and the tornadoes observed today appears to be one of scale only: an unusually strong bombardment of charged particles onto the ionosphere could have triggered the formation of a single collimated Birkeland current, of a semi-permanent nature, that was susceptible to a type of plasma instabilities known as ‘Peratt Instabilities’. 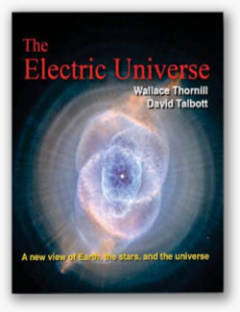 Crucially, the electric discharging occurring on this occasion will have been intense enough for the ‘dark’ plasma of the tornadoes as well as the solar wind to switch to glow or indeed arc mode, forcing the dazzling likeness of these space marvels onto the unprotected eyes of living beings on earth.